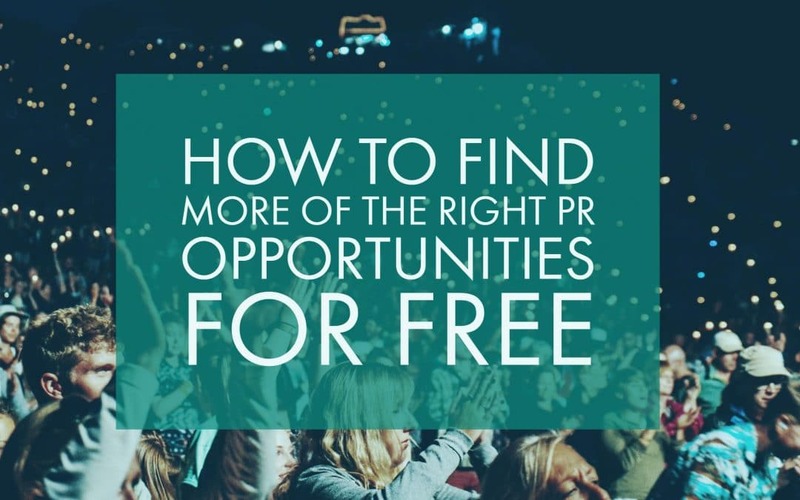 This post is all about how to find more of the right PR opportunities for free. It contains one of my best-kept secret methods for spotting PR opportunities in real-time so that you can respond to journalists and bloggers quickly in order to bag the coverage. This guide is the third instalment of my Ultimate Expert List of Awesome Free PR Tools, which is an ongoing project designed to help you get more out of your marketing campaign. If you would like me to get in touch when more of the incredibly useful sections are available, click here. But you might want to share my awesome PR Playbook with your friends and colleagues so they can start making their brands famous with lots of great PR strategies, tips, tactics and free tools! 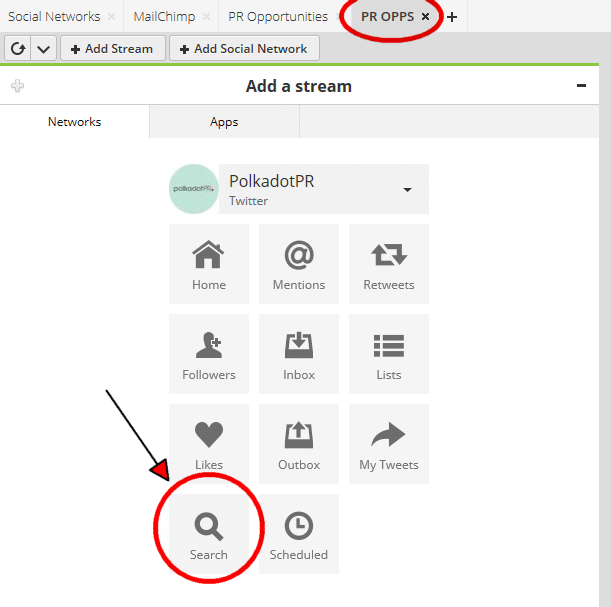 The following tools and methods will help you to find PR opportunities. Just so you know, if you really want to get more PR coverage and be given more opportunities to get it, nothing really beats building strong relationships with relevant influencers, journalists and bloggers. When you have these strong relationships, the influencers will often directly seek help from you, perhaps often not even asking anyone else. They will also willingly speak to you over the phone and they will actually read your emails and social media messages. This is why we are so successful at Polkadot Communications; generating hundreds of pieces of media coverage for our clients. We’ve got the right contacts and the strong relationships, and it’s this that is the foundation of our success. This might sound tough …. well building strong relationships in order to develop great reputations is hard work. So you need to put a lot of time and effort into doing this if you really want to be successful. I’ll cover techniques for doing this in another section in this mega-guide. However, the tools and methods outlined below will help you to find PR opportunities and respond to them. From there, you can build your relationships for more effective PR. These tools are a must-have for your PR arsenal. Hold onto your seat, let’s roll! This tool helps journalists urgently connect with sources. It’s a freemium product with an awesome free level of service, which is basically a daily digest email that you never have to pay for. 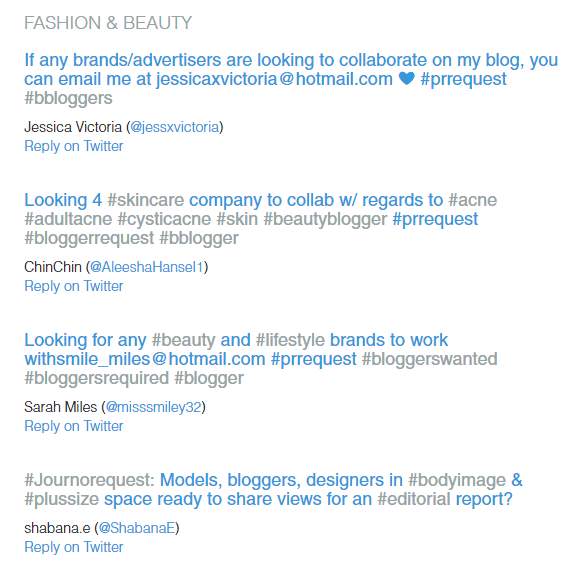 The email contains every single request based on the #journorequest hashtag on Twitter. It’s currently UK-focused, but there are international requests, and in the inclusive international digital world in which we live, coverage from overseas can still be extremely useful. After all, the big ticket in PR is gaining social proof from influencers. It often doesn’t matter where those influencers are. The company running this service does have plans to roll this out beyond the UK, so I’d recommend using it right away so that you don’t miss out on any opportunities. The email breaks down requests the requests from journalists made on Twitter into categories, which is great, and you can hit a ‘reply on twitter’ link to respond quickly. With the pro version, you can access a variety of useful features, but the free version is still fab. Respond as quickly as you can to the requests, journalists don’t hang around! 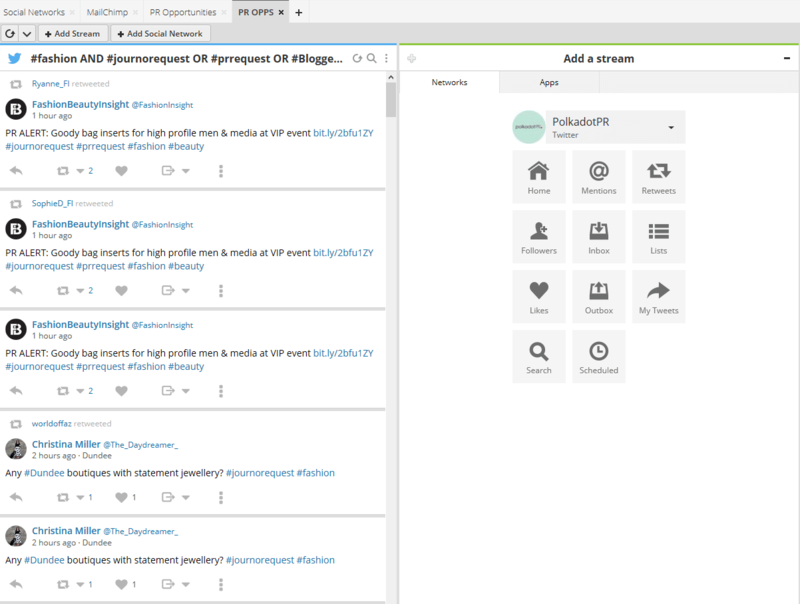 HootSuite is a social media management tool. You can link it to your various social media accounts (although not YouTube or Google+ yet) and manage them from a single place. This is, therefore, a great tool for making influencer marketing and PR more efficient and effective. I will cover this in more detail in a later section of the guide. So what is this tool doing here in this section of the guide? It’s because you can use it in a really clever way to pick-up journalist, blogger and influencer requests – INSTANTLY…For free! 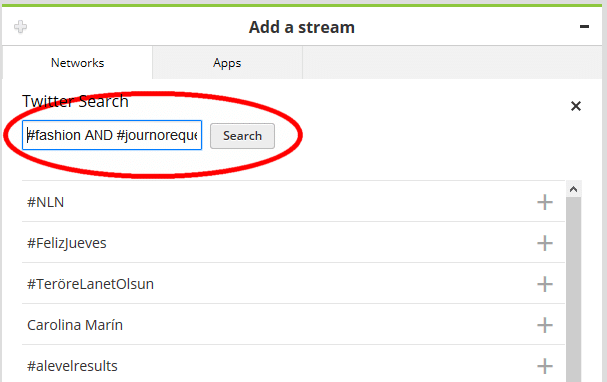 I didn’t mention it before JournoRequests.com because this method of using Hootsuite that I’m about to cover relates to the JournoRequests.com hashtag system, and so it gives some background context. …well not your competitors anyway. You need to actually set this system up, rather than just sign-up for alerts, like with the other tools covered in this guide. 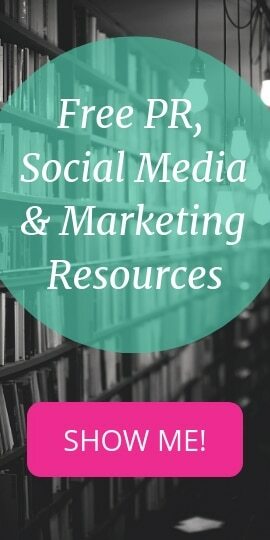 This is used by journalists looking for things like information on a topic, potential case studies, quotes from experts or products to review for articles/posts they are writing. It’s the foundation of the JournoRequests.com service, see the relevance now? Again, remember that this hashtag currently has a UK focus, but it is expanding. This hashtag is very similar to #journorequest as it was created for journalists to source stories etc. Most of the requests on this hashtag are now from bloggers, particularly useful for blogger outreach campaigns and gaining social proof through reviews. No surprises here, this hashtag is similar the previous two, but it really is focused on blogger requests. Help a Reporter Out or HARO, is an online tool for connecting journalists with sources. It’s a great tool and I will cover it next in this guide (scroll down to section #3 for more information). The system post requests from journalists using this hashtag, so we can tap into them here. Tweets with the hashtag #UrgHaro, therefore, indicate that the journalist is looking for a source URGENTLY! So respond to these requests very quickly if you can. And you can get more specific within a category like #beauty with a hashtag like #makeup. You could also use location-based hashtags in combination with all of the above. We work with numerous restaurants and hotels and as part of that, we seek opportunities relating to the physical locations of the business outlets. So for a restaurant client based in Sydney, we could monitor #restaurant and #sydney. This hashtag combination monitoring method is very important as it makes it far easier for you to spot relevant opportunities. BONUS TOOL TIP: Use Hashtagify to find the best relevant hashtags for this monitoring technique and for using in your own social posts. Create free (or paid) Hootsuite account if you don’t already have one. Link your social media accounts to it. Note that I have used ‘#fashion AND’ at the beginning. This is so that I can see the topic clearly at the top of the feed when it’s activated. The ‘AND’ part of this ensures that all of the search results for the various journalist requests contain #fashion. This is very important because I just want fashion related requests in this feed. The ‘OR’ function allows the search feed to include any of the four different request hashtags, so I get requests from all sources in relation to my fashion topic. If I wanted to be more specific, I could include additional AND/OR related hashtags. Create additional feeds for different topics, products, industries, locations, etc. 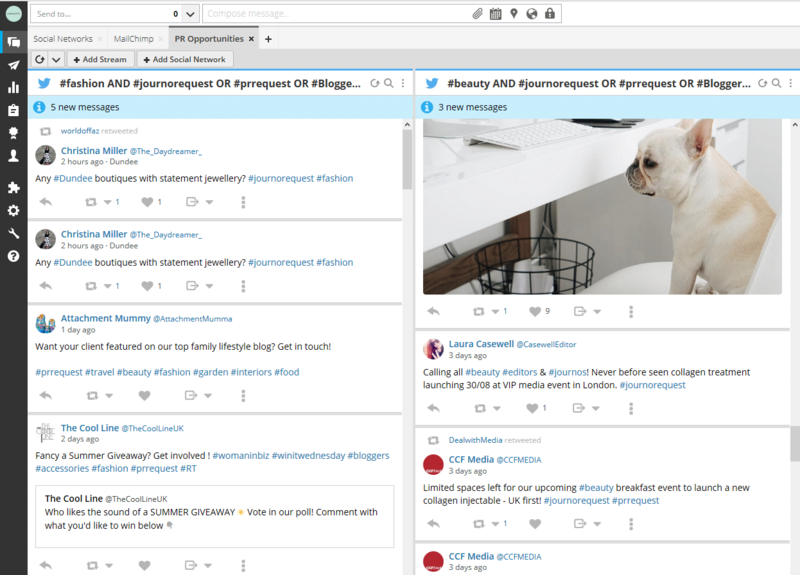 Now you’ve got a real-time request feed filtered to your business needs, and because it’s in HootSuite, you can respond directly to the requests through Hootsuite. This an awesome method as it allows real-time filtered monitoring of requests (you don’t have to wait for the free periodic emails from the other tools mentioned here). 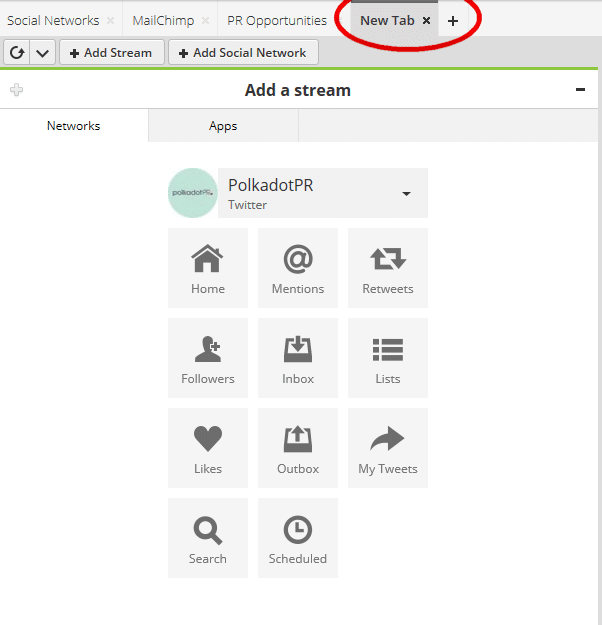 It also allows for direct responses through the Hootsuite system. This big tip could actually be applied to all of the tools mentioned in this guide. Before responding to requests, make sure that the request is worth responding to. If you read part 2 of this mega-guide; 13 Free PR Tools You’ll Love for Influencer Identification you’ll find free tools that will help you to establish how influential the influencer is (e.g. Kred, Klout, Followerwonk, LinkedIn). Avoid giving expensive products and services away for review to people with no influence who are just fishing for freebies. HARO provides journalists with a robust database of sources for upcoming stories, and daily opportunities for sources to secure valuable media coverage. You can join the 475,000+ HARO users already using the service to connect with journalists. All you need to do is register for your free account and then check your inbox three times a day (5:35 a.m., 12:35 p.m. and 5:35 p.m. ET), Monday through Friday. Look out for source requests relevant to you or your brand or client’s industry, expertise or personal experience. You can then pitch to the journalist by clicking on the masked HARO email address listed in the source request email. You should include answers to the journalist’s questions, any specified requirements and a bio with you or your client’s contact information. If the journalist is interested, they’ll reach out! Great free tool for getting regular journalist requests. When setting up your ‘source’ account remember to tick the topic boxes that are relevant to your brand or clients so that you get more relevant pre-filtered and grouped requests. You could also use the request information to create a database of contacts that you could contact directly to build relationships with and pitch stories to at a later date. This tool does basically the same thing as the other tools, it matches journalists with sources. It’s a good tool just like the others. Once you’ve registered you will get a daily email but you can also be more proactive with this tool because you can navigate to the ‘requests’ section and actually search for relevant keywords (e.g. ‘food’). You can then pitch directly through the tool interface very easily. Also, you can register as a publicist if you want to use this tool to pitch on behalf of your clients. Once registered as a publicist you can then add clients to your profile and pitch on their behalf. Unlike the other tools, you can create a profile for yourself. It’s important to do this well because it’s sent to the journalists with your pitches. It helps them get a feel for your background, experience and expertise so that they can essentially vet you before responding to your pitch. So write a compelling bio for yourself, and for each of your clients, if you are a publicist. With these tools, you will be able to find great PR opportunities for free. If you use this in combination with the free tools mentioned in my other guides you’ll be able to be more strategic when choosing the opportunities to go for. We’d love to hear about how you get on with these tools and how they help you to either get started or enhance your current campaigns. We hope that these tools will help save you precious time and money, whilst making your campaigns more effective and generating a really awesome return on investment you can be proud of. For the last ten years, we have gained literally thousands of pieces of media coverage for our clients, exposing their brands to millions of people in Australia and around the world. You can book in for a free PR consultation here with Dionne Taylor, the Polkadot Communications founder.